That won't work; space combat has to use SUs to fit with the system. For the purpose of being targeted and chased I would treat bombers as stationary targets - only range penalty. More appropriate would be a rule that Fire Control suffers penalties based on how fast the bomber is moving; the faster the bomber, the harder it is to get the free-fall bombs to accurately deploy to hit the target. Yes for traditional bomb runs. But for the purposes of hitting a ship of app. 7.5 km long with a low attitude approach - it's hard to miss. Pretty sure the goal was to hit a specific part of a 7.5km long ship. That's just a tad harder. I almost made the Dr. Evil joke, but I didn't remember if the sharks had frikken laser beams attacked to their heads. I guess they did! And I think there may have been some ill-tempered mutated sea bass as well. Maybe, but it still doesn't justify them moving THAT damn slow. I recommend the whole material as two more issues are addressed there. ...I'm planning to see Aquaman this weekend. Judging by the ticket sales and reviews, it seems to be doing really well. You'll like it. The acting and story are engaging with just the right blend of humor, drama, and action. ILM did the effects and when they first showed Atlantis, my jaw dropped. There's also another Star Wars connection: Temura Morrison plays Aquaman's dad, although in the beginning he has so much CGI botox you can hardly tell it's him (very distinctive voice, though). Later, they show him unaltered and he's easily recognizable. Overall it appeared they had a lot of fun making this film and it shows through the production. It's just a good movie. So Jango Fett is in Aquaman? Nice, another reason to go see it. Jango Fett is Aquaman's dad. Yup, and he doesn't get beheaded in this one! 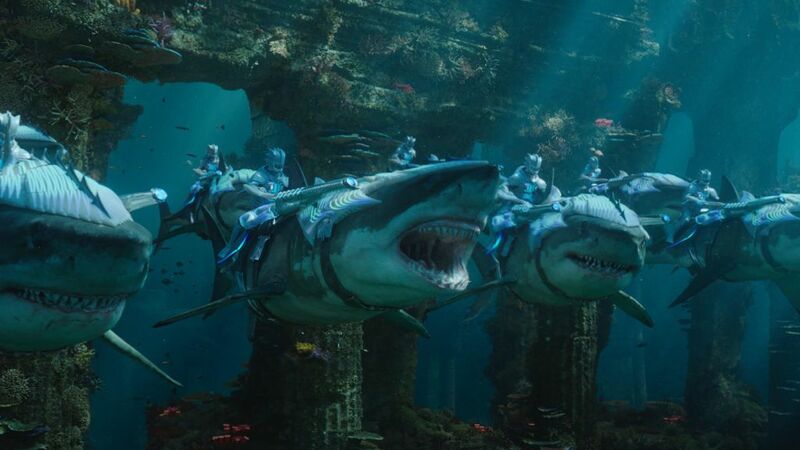 The armored sharks are also very cool. No lasers, though. I just watched this, it was way better than I expected. Thanks for sharing it. "Plot holes" isn't really my problem with the PT. It's more that the characters feel pointless and the old characters are being handled in a way that seems... off. The bombing scene was one of the best bits of cinema as art, out of the two PT movies so far. And tying Rose into it in some way has made her the only compelling sequel character for me. For me, personally, I can't understand Luke stubbornly wanting to stay on that rock when Chewie and R2 show up in THE Millennium Falcon. I just cannot identify with new-Luke at all. New-Leia's alright but Carrie Fischer had sadly aged in such a way as to break down the movie magic. When I look at new-Leia, all I can see is the troubled life of Carrie Fischer. New-Han and Chewie have their own issues, but I've rambled enough. New-3PO is as awesome as ever. "You probably didn't recognize me because of new arm" was just great. I do enjoy the ST, or Solo, but, it's the way one enjoys going on the Star Tours ride. It's fun but, it doesn't stick with me when I leave the theater.